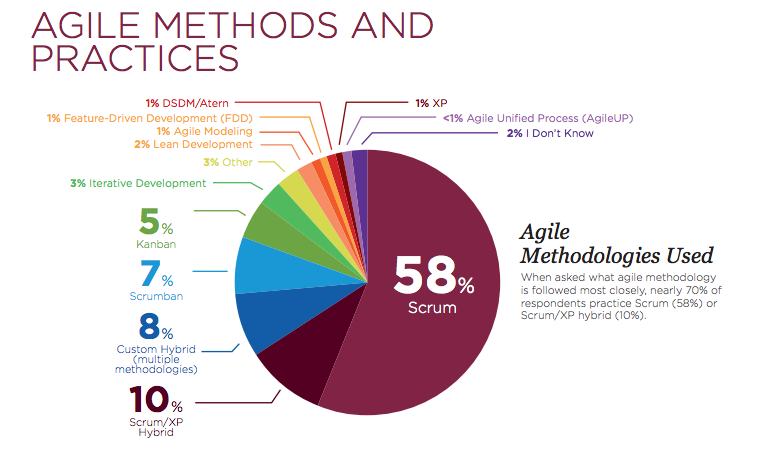 For those who haven’t spent a lot of time exploring its nuances, Agile comes to mean merely fast or hyper-productive. Marketers who prowl the internet for a couple of hours and think they’re up to speed on all Agile has to offer often fall into this trap. If you hear someone say something like, “Why can’t you drop everything and start on this brilliant idea? I thought you were agile now,” they’ve got the first part of this definition wrong. 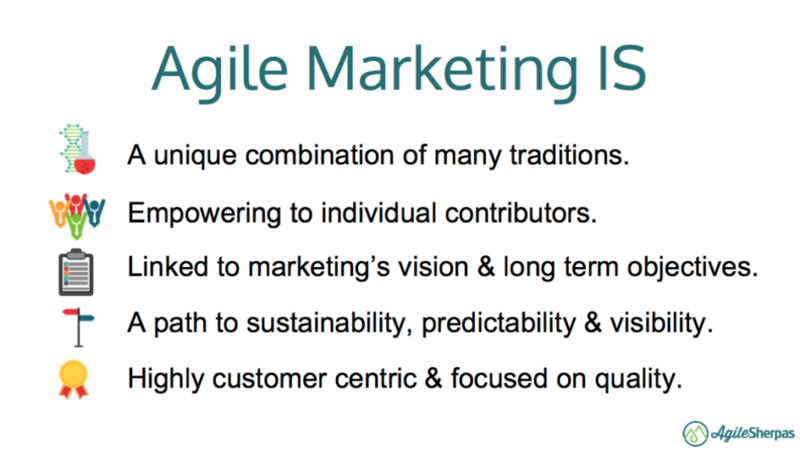 Then we’ve got the word “marketing,” which can trip up long-time agilists just as badly as “Agile” can confuse marketers. 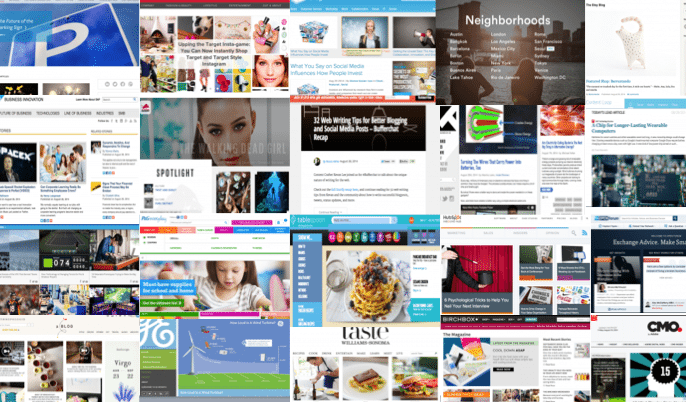 So what is agile marketing, really? Agile is not limited to software development. Agile doesn’t sacrifice planning and stability for the sake of speed. Agile Marketing puts decision making in the hands of marketers, achieving strategic business objectives as well as benefiting customers. 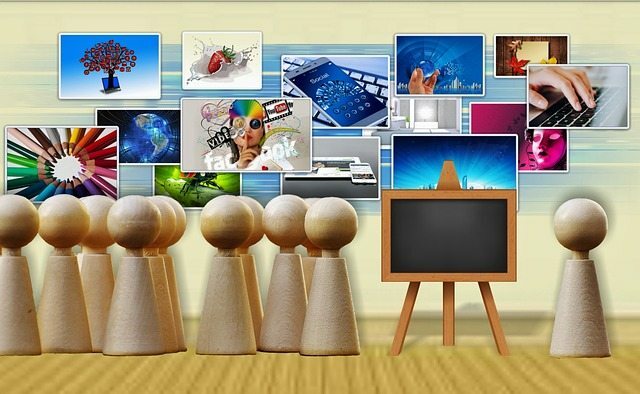 Agile Marketing aims to do away with the limitations of traditional marketing. 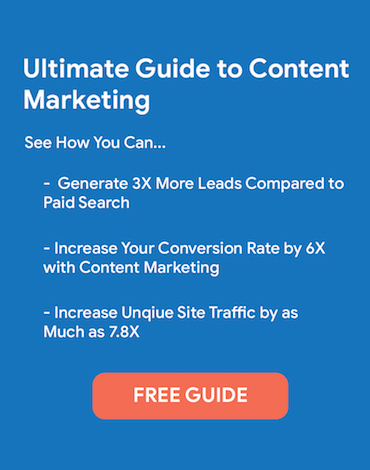 Many coaches and trainers from the software world underestimate the complexity of modern marketing, and think their usual approaches will do the trick. But marketing is a unique beast…or maybe a unicorn. Either way it’s not like software. An Agile coach leading the marketing transformation inside IBM recently told me as much, calling marketing work “utterly different” from the development work he had previously worked to transform. “It’s complicated in its own special way,” he said. Misunderstandings abound on both sides, so let’s clear the air and create a nice solid Agile marketing definition. It’s often easiest to start a definition by clarifying what something is NOT, so let’s see where that can get us. We’ve already touched on the first item in this list: Agile marketing isn’t a carbon copy of Agile software development. It follows similar values and principles, but even a cursory glance at the manifestos from these two movements will show distinctions. There’s no need to exhaustively catalog each and every difference between these two professions. The important thing here is to realize that you can’t train an Agile marketing team exactly the same way you’d train a development team. I’ve talked to the marketers who’ve gone through those sessions, and they’re still very confused. Yes, both are types of knowledge work, and both can benefit greatly from Agile practices. But please, my fellow Agile trainers, don’t talk about features and releases to marketers. Speak our language if you want us to get it! Not to say that Scrum can’t work for marketing; implemented correctly (and with the appropriate adjustments) it can be useful. 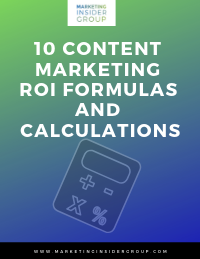 But most marketing teams need a larger buffet of options to choose from. So, Agile marketing requires the understanding and intelligent implementation of practices from many frameworks and traditions. It’s not just Scrum. Yes, we have plans on Agile marketing teams. In fact, we tend to have more plans than traditional teams, they’re just smaller and more flexible. Note in the image above how there’s a series of small, iterative plans that allows an Agile marketing team to make adjustments and hit the moving target. A heavy up-front plan assumes that we know everything about how a project or campaign is going to go, which we almost never do. That’s the power of Agile; it assumes that we can’t know everything before we start work, so we should create a system that readily incorporates change. Think about it like driving a car to a new destination. You need to know where you’re going, what the ultimate objective of the trip is, but you also need some flexibility to allow you to adapt to the real road conditions along the way. There might a wreck, or a road closure, or even just a really slow car in your lane. Your plan should be flexible enough to let you respond to that new information. 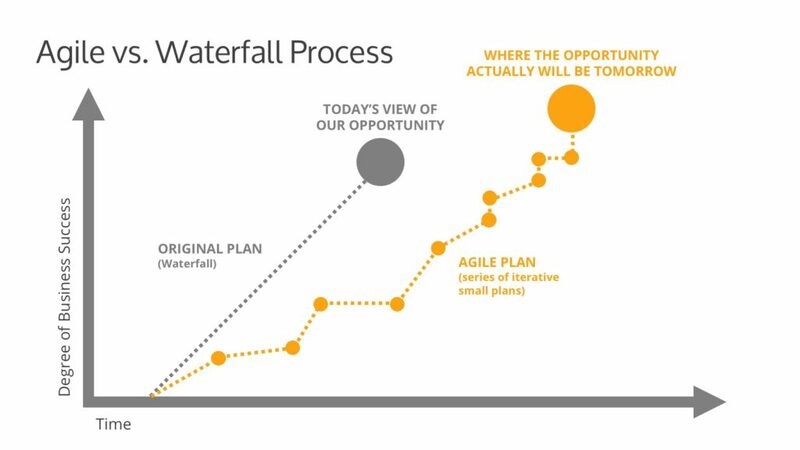 Agile plans work exactly the same way. We’re going to get into this more later when we talk about customers and quality, so let’s me just reiterate briefly: we don’t go Agile just to be fast. Speed is generally beneficial; campaigns that take 12 months to get out the door are simply not competitive anymore. But speed is a byproduct of agility, not its ultimate aim. By removing waste from the system, empowering individual team members, focusing on high value work, and limiting our work in progress we do go faster, but the real win is that we’re more responsive to customer and business needs. Oh, the constant pivot. This was the bane of my first Agile marketing team’s existence. The ability to adapt to change is powerful, but when that change is arbitrary and/or daily, it becomes a serious source of stress for the team. They’re reluctant to commit to deadlines or large projects, because there’s no guarantee they’ll be given the space they need to actually complete something. The Pivot Posse might jump in at any moment and derail them. Agile marketing requires leadership to set clear objectives; the team needs to know where they’re driving their car. They can (and should) adjust their route along the way, but if you change the goal all the time you’ll never get anywhere, even if you’re Agile. Ok, now we’ve got the negatives out of the way, let’s consider some positives. 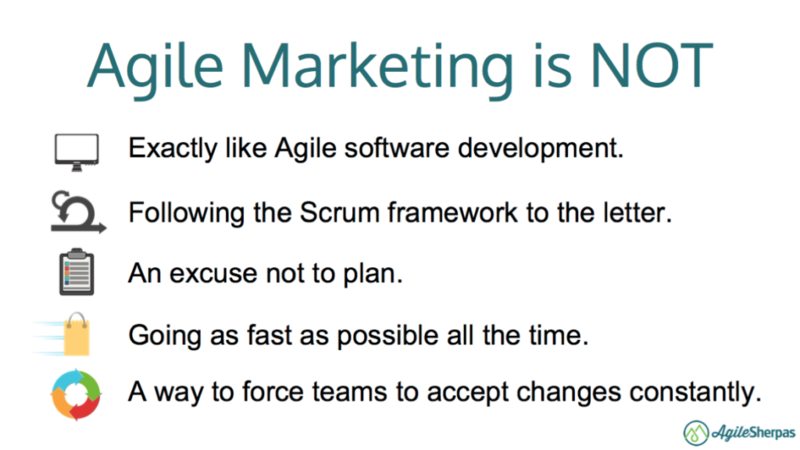 If Agile marketing isn’t just Scrum…what is it? 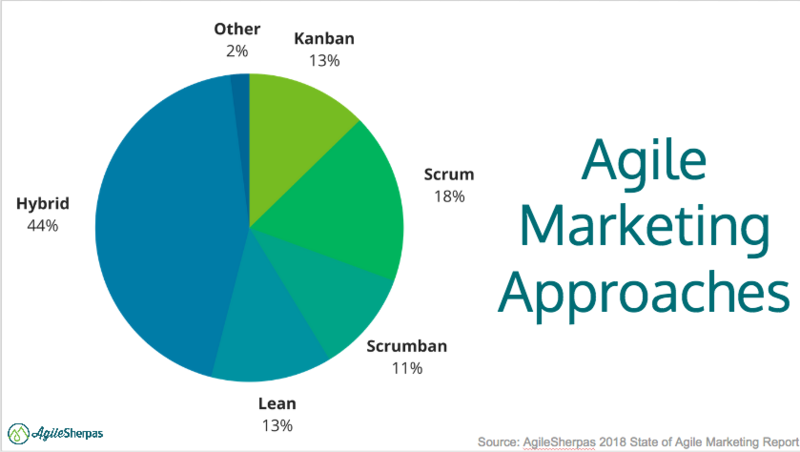 Having trained over 1,000 marketers in my time, I can tell you that the biggest piece missing from most Agile marketing approaches is Kanban. Basically Kanban gets rid of the timeboxed sprints from Scrum and focuses instead on achieving a steady, continuous flow of work through a team. Because many kinds of marketing work don’t fit naturally into a 2-3 week period, sprints can feel like arbitrary (yet extremely stressful) deadlines. Kanban alleviates this pain. For teams who receive lots of external requests, internal and external agencies, creative services teams, and anybody who’s ever found it hard to meaningfully chop their work up to fit in a sprint, Kanban may be your answer. 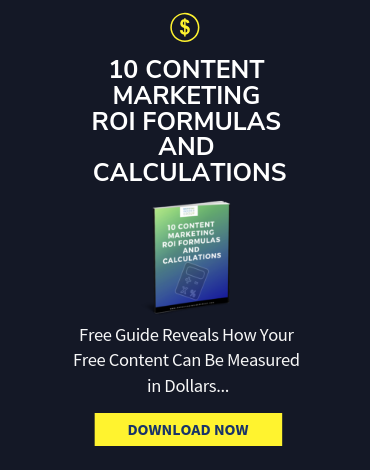 There’s also a lot for marketers to learn from the lean tradition of waste reduction, as well as the Theory of Constraints and its focus on mitigating the effects of bottlenecks. 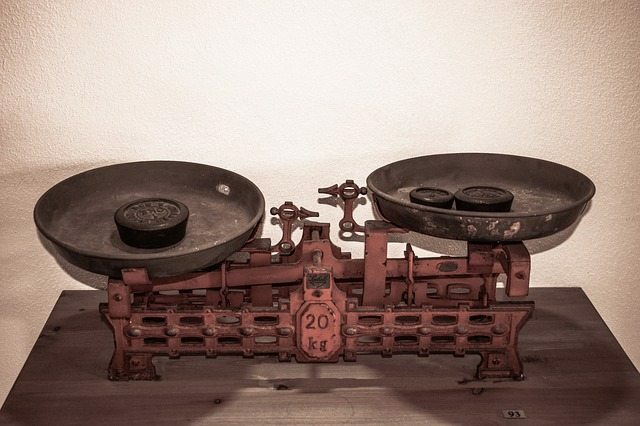 Ultimately, every Agile marketing implementation looks a little different. Get all the information, and make an informed choice about what practices are right for your team. Since Agile marketing combines lots of different ways of thinking and acting, you might be wondering who decides which ones are the right ones? 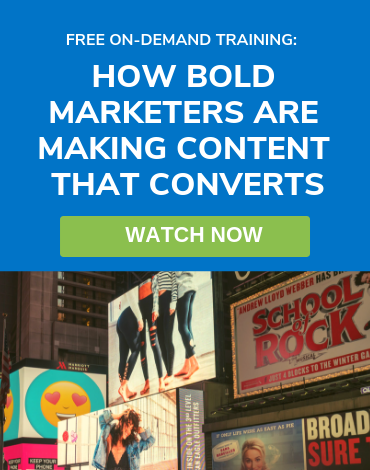 Ideally, the marketers themselves make that choice. The Agile tradition is very focused on pushing decision making capabilities down the org chart. It believes that the people doing the work know the most about how to get it done, so they should be able to make certain choices. For those of us who haven’t ever worked in an environment like that, it can be hard to get in the habit of making a call rather than waiting for your manager to tell you what to do. Giving people on the team the option to design their own Agile marketing approach is a perfect way to start exercising these autonomy muscles. Following an Agile rollout, individual contributors continue to play a big role in Agile marketing. We want to shorten feedback loops as much as we safely can, reduce handoffs, and eliminate status meetings in our quest for agility. As you can imagine, all of those demand more independence in the people actually doing the work. So if you’re a marketing leader thinking Agile is the perfect way to squeeze more productivity out of your team, be warned: a good Agile marketing transformation will give you more productivity, but it will also give you empowered, autonomous, independent team members who will be able to tell you “no” a lot more. Because of the misconception that Agile marketing just means going faster, there’s a similar belief that once we’re Agile, we stop planning. Thankfully, that’s just not true. The daily activities of an Agile marketing team need to be clearly connected to long term strategic objectives for both the marketing organization and the company as a whole. Leadership isn’t off the hook once a marketing department goes Agile. They need to set priorities, keep them stable so teams can plan around them, and communicate them down to the teams and out to other stakeholders. That last part is particularly important, because it allows the teams (who are empowered to say “no,” remember) to push back on external requests that don’t align with their goals. Of course, it’s not just high level strategy that needs to be visible. The status of daily activities needs to be transparent too. Enter the kanban board, the source of truth for all good Agile teams. This board tells anybody inside or outside the team how things are going. What’s being worked on, who’s working on it, is it moving forward or blocked — all this and more shows up on a well visualized workflow. You can use a physical board (whiteboards and stickies are SO MUCH FUN), or you can go digital if you need people outside the building to access your board. Getting your work out in the open like this not only satisfies Agile’s need for visibility, it also allows us to start predicting when things will be done (even if we aren’t using sprints), and throttling down our work in progress so we can achieve a sustainable pace of work. Remember, we’re not just trying to go as fast as we can all the time. We want to be able to work at a steady, predictable pace indefinitely, and a good kanban board will help us get there. Last, but most certainly not least, Agile marketing does it all in service of producing high quality marketing that serves the audience. Doing crappy work faster is not the goal. We want to consider how all our activities are delivering value to customers, which is one of many reasons why we document our work with user stories. And of course, whether you’re Agile or not, the only way we can make any kind of impact in an increasingly noisy digital space is to create stuff that’s awesome enough to compete with videos of goat yoga. So yes, speed is great. Productivity is great. Empowered teams are really great. But it’s all there to serve the audience (as it should be). 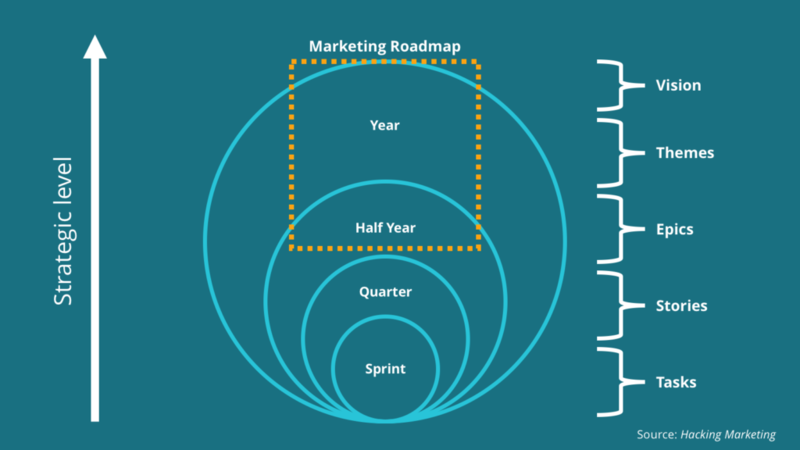 Have a Different Agile Marketing Definition? Do you disagree with any of my defining points? Have some you think need to be added? Drop me a comment — I’d love to evolve this definition with the community! The post A Complete Agile Marketing Definition first appeared on AgileSherpas.com.